The hagiographers* wrote biographies of Saint Francis, notably Thomas of Celano who wrote Life of Saint Francis, 1228-1229, and then a second life. Saint Bonaventure wrote The Life of St. Francis later. These are not historical biographies, and one may find much confusion if searching for information as in an historical biography. In the early documents, The Legend of the Three Companions is often referred to as more precise and better informed than the others on the early life of Saint Francis. For a scholarly biography written recently, the book referred to above by Vauchez Andre is highly recommended and enlightening. The early documents may be found in the four volume set Francis of Assisi, Early Documents, listed on Resources page. Francis of Assisi did some amazing things during his life, but it wasn’t the extraordinary things that made him a saint and still revered today. Most of Francis’s life was lived simply and ordinarily. How he did those ordinary things, the embrace of a marginalized person outside the Assisi walls, the conversation with a leader of another faith, the nonviolent being-in-the-world, the love of all creation, the simplicity of his needs and desires—this is what made him a saint. The way we live our lives, striving to make our whole lives our prayer, is what will make us saints too. Our lives of Gospel living, our living the Franciscan tradition in the world, deeply in love with God, begins as so many amazing love stories do: with a first date. —from Dating God: Live and Love in the Way of St. Francis (2012). Author: Daniel P. Horan, OFM. Francis’ agenda is so simple that it is often overlooked, even among his followers and admirers. Francis’ only desire was – as the Franciscan theologian Regis Armstrong, OFM Cap., often says and to which I completely concur – to live more fully his baptismal vocation of following the Gospel. . . . Francis’s entire motivation was to live radically, that is “return to the root” of the Gospel. God inspired me, too, and still inspires me with such great faith in priests who live according to the laws of the holy Church of Rome, because of their dignity, that if they persecuted me, I should still be ready to turn to them for aid. And if I were as wise as Solomon and met the poorest priests of the world, I would still refuse to preach against their will in the parishes in which they live. I am determined to reverence, love and honour priests and all others as my superiors. I refuse to consider their sins, because I can see the Son of God in them and they are better than I. I do this because in this world I cannot see the most high Son of God with my own eyes, except for his most holy Body and Blood which they receive and they alone administer to others. Above everything else, I want this most holy Sacrament to be honoured and venerated and reserved in places which are richly ornamented. Whenever I find his most holy name or writings containing his words in an improper place, I make a point of picking them up, and I ask that they be picked up and put aside in a suitable place. We should honour and venerate theologians, too, and the ministers of God’s word, because it is they who give us spirit and life. When God gave me some friars, there was no one to tell me what I should do; but the Most High himself made it clear to me that I must live the life of the Gospel. I had this written down briefly and simply and his holiness the Pope confirmed it for me. Those who embraced this life gave everything they had to the poor. They were satisfied with one habit which was patched inside and outside, and a cord, and trousers. We refused to have anything more. Those of us who were clerics said the Office like other clerics, while the lay brothers said the Our Father, and we were only too glad to find shelter in abandoned churches. We made no claim to learning and we were submissive to everyone. I worked with my own hands and I am still determined to work; and with all my heart I want all the other friars to be busy with some kind of work that can be carried on without scandal. Those who do not know how to work should learn, not because they want to get something for their efforts, but to give good example and to avoid idleness. When we receive no recompense for our work, we can turn to God’s table and beg alms from door to door. God revealed a form of greeting to me, telling me that we should say, “God give you peace”. The friars must be very careful not to accept churches or poor dwellings for themselves, or anything else built for them, unless they are in harmony with the poverty which we have promised in the Rule; and they should occupy these places only as strangers and pilgrims. In virtue of obedience, I strictly forbid the friars, wherever they may be, to petition the Roman Curia, either personally or through an intermediary , for a papal brief, whether it concerns a church or any other place, or even in order to preach, or because they are being persecuted. If they are not welcome somewhere, they should flee to another country where they can lead a life of penance, with God’s blessing. I am determined to obey the Minister General of the Order and the guardian whom he sees fit to give me. I want to be a captive in his hands so that I cannot travel about or do anything against his command or desire, because he is my superior. Although I am ill and not much use, I always want to have a cleric with me who will say the Office for me, as is prescribed in the Rule. All the other friars, too, are bound to obey their guardians in the same way, and say the Office according to the Rule. If any of them refuse to say the Office according to the Rule and want to change it, or if they are not true to the Catholic faith, the other friars are bound in virtue of obedience to bring them before the custos nearest the place where they find them. The custos must keep any such friar as a prisoner day and night so that he cannot escape from his hands until he personally hands him over to his minister. The minister, then, is strictly bound by obedience to place him in the care of friars who will guard him day and night like a prisoner until they present him before his lordship the Bishop of Ostia, who is the superior, protector, and corrector of the whole Order. The friars should not say, this is another Rule. For this is a remainder, admonition, exhortation, and my testament which I, Brother Francis, worthless as I am, leave to you, my brothers, that we may observe in a more Catholic way the Rule we have promised to God. The Minister General and all the other ministers and custodes are bound in virtue of obedience not to add anything to these words or subtract from them. They should always have this writing with them as well as the Rule and at the chapters they hold, when the Rule is read, they should read these words also. In virtue of obedience, I strictly forbid any of my friars, clerics or lay brothers, to interpret the Rule or these words, saying, “This is what they mean”. God inspired me to write the Rule and these words plainly and simply, and so you too must understand them plainly and simply, and live by them, doing good to the last. And may whoever observes all this be filled in heaven with the blessing of the most high Father, and on earth with that of his beloved Son, together with the Holy Spirit, the Comforter, and all the powers of heaven and all the saints. And I, Brother Francis, your poor worthless servant, add my share internally and externally to that most holy blessing. Amen. “Sweet Francis of Assisi, would that he were here again!” Tennyson. With our whole heart, our whole soul, our whole mind, with our whole strength and fortitude with our whole understanding with all our powers with every effort, every affection, every feeling, every desire and wish let us all love the Lord God Who has given and gives to each one of us our whole body, our whole soul and our whole life, Who has created, redeemed and will save us by His mercy alone, Who did and does everything good for us, miserable and wretched, rotten and foul, ungrateful and evil ones. Therefore, let us desire nothing else, let us want nothing else, let nothing else please us and cause us delight except our Creator, Redeemer and Savior, the only true God, Who is the fullness of good, all good, every good, the true and supreme good, Who alone is good, merciful, gentle, delightful, and sweet, Who alone is holy, just, true, holy, and upright, Who alone is kind, innocent, clean, from Whom, through Whom and in Whom is all pardon, all grace, all glory of all penitents and just ones, of all the blessed rejoicing together in heaven. ” . . . O holy town of Assisi, you are known in the whole world for the one fact of having given birth to the Little Poor One, your Saint, so seraphic in his love. May you understand this privilege, and offer to all people the spectacle of such a faithfulness to Christian tradition that it will be to your real and everlasting honour.
. . . 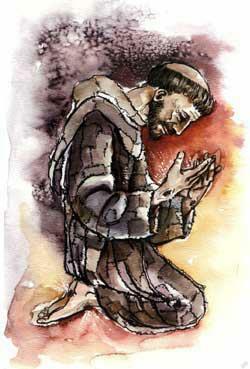 Here, with Saint Francis, here we are truly at the gates of Paradise.